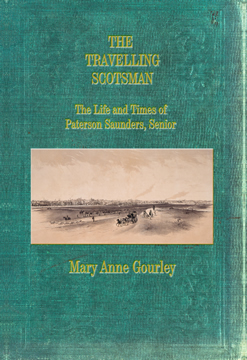 The Travelling Scotsman, the life and times of Paterson Saunders Senior is the biography of a man whose adventures and travels began at an early age of eighteen and continued for the rest of his life. He had a career in commerce and journalism. Paterson’s time spent in Victoria at the time of the Gold Rush was not a success financially. Returning to India saw more financial troubles. During the 1857 Sepoy Mutiny in India Paterson’s heroic efforts brought him praise and recognition from the British Government. Two Years in Victoria is a series of articles written by Paterson Saunders Senior between 1855 and 1863 and covers one part of his life – his trip to Victoria in 1853 at the height of the Gold Rush.